Bravo’s Top Chef is my favorite show. EVER. It’s embarassing to admit, but I actually squeal with delight and clap my hands together when this shows comes on. Like one of those little monkey toys that bares its lips and bangs cymbals together. Really. Tonight is the Season 2 Finale. It’s come down to Ilan vs. Marcel. I think they’re both talented, but, for some reason, Marcel has been cast as the “villain” this season. Is he arrogant? Yes. Is he annoying? Yes. But, can the boy cook? Hell, yeah! So, part of me wants to see Marcel win just because he’s the “underdog”. Some crazy woman actually attacked this poor guy on the street with a bottle and he had to get a ton of stitches. Because she thought he was a jerk on a TV show. 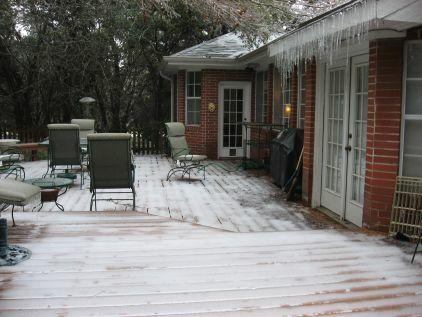 How crazy is that??? This poor guy was woken out of a sound sleep to a huge, muscular colleague chef attacking him and trying to shave his head. Marcel, in my opinion, has gotten a raw deal. Marcel’s recipes, however, are hard to duplicate because he uses lots of lecithin and xanthan gum and odd emulsifiers and foam-making supplies, so……tonight I’m trying one of Ilan’s recipes as a tribute to the final episode of Season 2. Ilan is charming, talented and does a better job of motivating his co-workers. My prediction is that he will win tonight. This recipe (from Episode 11) got RAVE reviews from the judges. I had to adapt it quite a bit, because my family doesn’t do clams, but the final result was VERY VERY good. You can find the recipe here (my adaptations are below). 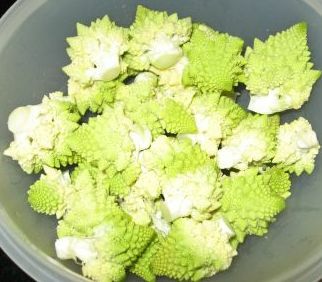 The Romanesco cauliflower is also from my in-law’s farm. It is an heirloom Italian variety and its spirals follow the Fibonacci sequence. 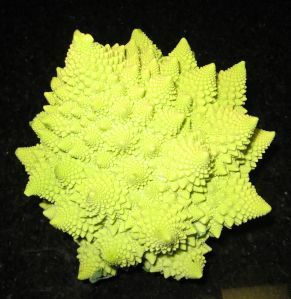 Imagine that: a fractal veggie! It also happens to be quite yummy. My photography skills leave a little something to be desired, but it really is quite “otherworldy” looking. I used two pre-grilled (seasoned with salt and pepper) chicken breasts, sliced into bite-sized pieces, instead of the clams. I used more cauliflower than the recipe called for (maybe an additional 3/4 cup). 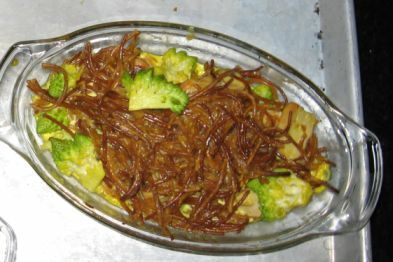 Even at that, it could have used a little more, since we were using this as our main course, and not starter, which is how Ilan used it. I made 4 oval baking dishes of the fideos and still had enough left over to make two more separate bowls, but I removed the cauliflower from those, because there wasn’t enough to go around. I’ll add veggies to those leftovers later for tomorrow’s lunch. 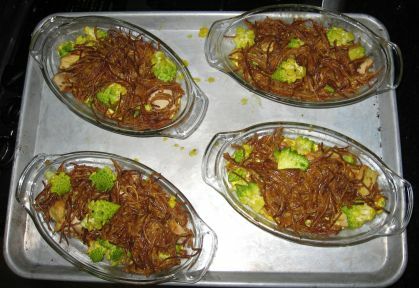 I used some chicken stock (maybe 2 cups), in addition to the white wine, to cook the fideos in before they were broiled. Ilan’s recipe was not really clear (at least not to me) about what to do with the garlic. It never said to take the garlic cloves out of the dish, but it didn’t say, either, that they should be chopped or minced. I’m sure for CIA-grad Ilan, this sort of thing is intuitive, but I wasn’t sure, so I just used 5 cloves of garlic, instead of the 8 or 10 that was called for. I ran them through a garlic press and left them in the dish. I forgot to add the parsley, which is a shame, because I have fresh Italian parsley growing outside, but it’s cold here and the kids are sick, so it just slipped my mind. The dish was great, but would have been better with just a tiny bit of parsley. Oven-toasted Fideos (I probably over-toasted them just a bit, but they still tasted great. 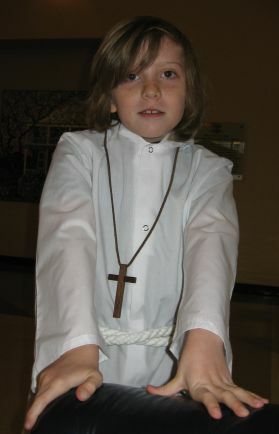 My handsome Boy was crucifer at school last week. Toss chicken pieces with Baby Bam seasoning. Saute sausage slices in a large, flat pan until lightly browned. 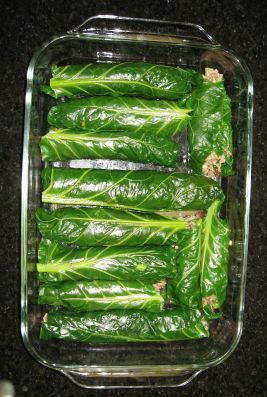 Remove from pan (leave sausage fat in pan) and set aside in a large bowl. Add seasoned chicken pieces to hot sausage fat in pan and saute until browned. Remove chicken from pan and set aside in bowl with sausage. Add onion, garlic, bay leaves, green bell peppers, celery and okra to pan. Saute until veggies are softened and onions are translucent. Remove from pan, leaving any remaining fat in pan, and set veggies aside in bowl with cooked meats. Add enough canola oil to pan to make 1 cup of grease/fat. Heat oil/fat mixture until very hot, but not smoking. Carefully add flour to pan, quickly whisking to get rid of lumps, to make a smooth roux. Cook roux over medium heat, stirring frequently, until roux is a dark chocolate brown. This may take some time, a half-hour or more. 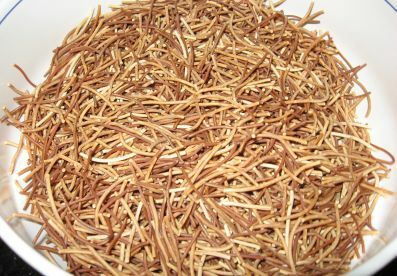 This roux is maybe a hair past what is called “blonde roux”, which can be used in making sauces, but for gumbo, it’s not quite there yet! 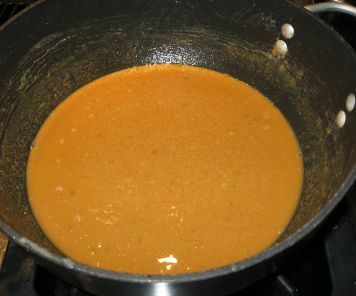 NOTE: If you cook on low enough heat, and stir frequently enough, it is VERY hard to burn or scorch your roux. Every time that I have thought that my roux was too dark or that I burned it, it turned out, once the gumbo was finished, that it was not too done, and was maybe even underdone. It is OK for it to be DARK. I used to even have a black cat named Roux, because if it is made properly, it really is almost black. Paul Prudhomme says that it should be the color of a Hershey bar. This is JUST about right…..
Once your roux is dark enough, gently stir in sauteed chicken, sausage, veggies and hot chicken stock. Be careful not to splash any of the hot roux on yourself – Paul Prudhomme (rightfully) calls this stuff kitchen napalm – ouch! Stir well to thoroughly combine. Increase heat and bring to a boil. 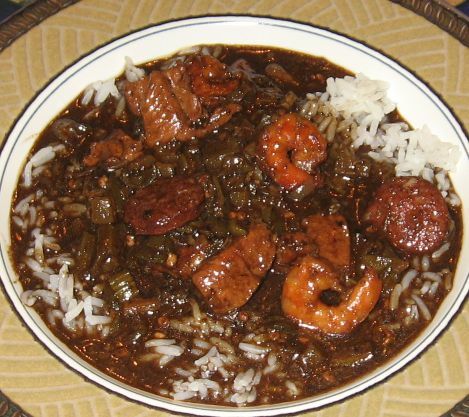 When gumbo reaches a boil, lower heat and simmer for 30 minutes, stirring frequently. Gently drop in frozen shrimp and simmer for another 15 minutes. Put rice in to cook, using chicken stock for cooking liquid. NOTE: I use brown rice for almost everything else, but for gumbo, I MUST have plain-old white rice. Again, I suppose it’s a matter of what you’re familiar with. For me, brown rice would just not be right for gumbo. Season gumbo with salt, pepper, cayenne and/or Tabasco to taste and serve over rice. You can remove the bay leaves, if you can find them, but I don’t think it’s necessary. 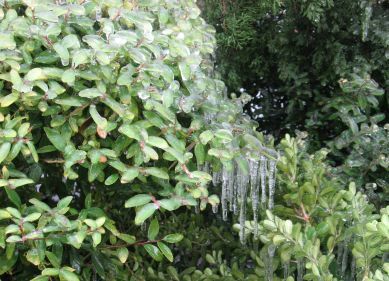 In my family, we always said that it was good luck to get the bay leaf, cherry pit, etc. in your portion of a dish. Of course, this could be something that my mother and grandmother (eternal “glass half full” types, both of them) “cooked up” to convince us that their cooking errors were “special surprises”. I made this recipe again this week. 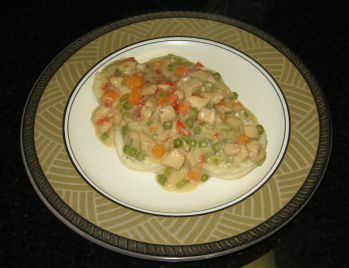 It’s one of our favorites, but this time I actually made it the way that I usually do, with buttermilk biscuits instead of sweet potato and with green peas instead of green beans. t’s neither gourmet, nor particularly picturesque, but the kids do really like it. Great cold-weather comfort food. Hubby douses his with sriracha, but he does that with everything. 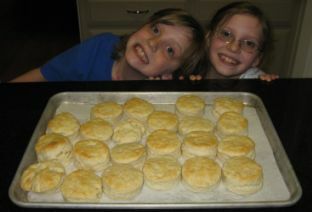 Here is the buttermilk biscuit recipe that I use. I usually use the biscuits for Chicken a la King, but they are equally good to accompany any dinner or for a special breakfast treat. Girl LOVES them with Strawberry Butter (mix together 1/2 cup softened butter and 1/2 cup strawberry preserves). I used to make biscuits with sausage gravy for Hubby every once in a while, but I’ve forgotten and haven’t done that in a while. Hmmmmm……maybe next weekend. Stir together flour, baking powder and salt. 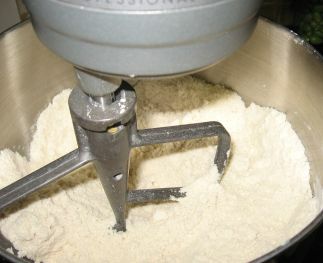 Cut butter into flour mixture with stand mixer or pastry cutter until mixture has a uniform, “mealy” texture. Blend in buttermilk only until ingredients are combined and starting to form a ball. 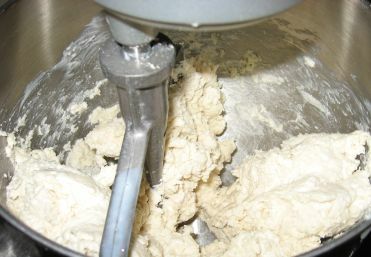 Place dough on a lightly floured surface. Roll out to about 3/4-inch thickness and cut with a biscuit cutter (mine is about 2.5 inches across), using a little extra flour, if necessary. Do not “twist” the cutter as you cut; only cut straight down. Place dough circles on a baking sheet that has been lined with parchment paper. Brush with half of melted butter. Bake at 425 degrees for about 15 minutes. 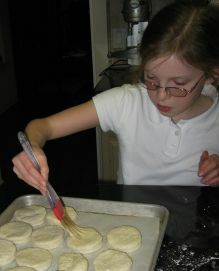 Watch biscuits carefully; they should only be cooked until they are no longer “doughy” in the middle or on the bottom and are browned on top. Remove from oven and brush with remaining melted butter. Makes about 22 biscuits. These have been a family favorite since I was a little kid. 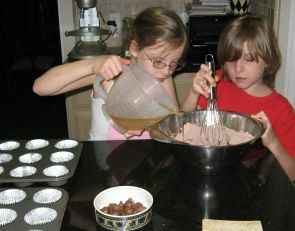 Now, Boy and Girl LOVE to help make these and they are SO yummy. They have a wonderful, moist texture (because of the vinegar) and rich flavor (because of the coffee). NOTE: You don’t HAVE to use foil liners, but I think they’re fun, because the foil makes the cupcakes look like foil-wrapped kiss candies. 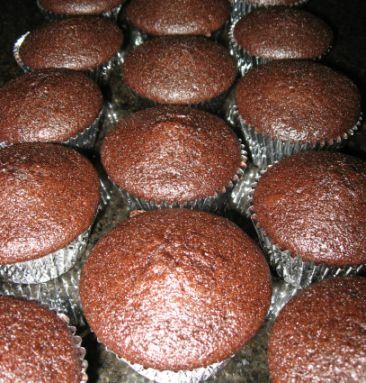 I think that they also (unlike the paper ones) make the cupcakes less likely to burn on the bottom. Preheat oven to 350 degrees. Place a foil liner in each of 24 muffin cups. Mix all dry ingredients together until uniformly blended. In a batter bowl or small pitcher, stir together liquid ingredients. Pour liquid into dry ingredients, stirring until smooth. Pour about 1/4 cup of batter into each muffin cup. Place a chocolate candy into batter in each cup, point end down. Pour remaining batter over candies to completely cover them. 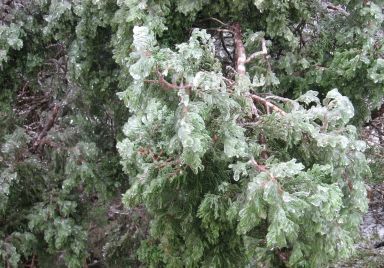 Bake at 350 degrees for about 22 minutes, or until top is slightly “springy” to the touch. These are VERY good, just as they are, but you may frost them if you’d like. I never have, but I think vanilla frosting would be better on these than chocolate, and go easy, because these are already VERY rich. This is the recipe that we learned at the family cooking night at Whole Foods, but I’ve adapted the recipe a tiny bit to suit our tastes. These are REALLY good. The kids even like them, although they drink a lot of water with them! We went to another cooking class at Whole Foods last night and my parents watched Girl (Boy was at a sleepover) for us (it was an adults-only class: Duck Breast Fillet, Spaghetti Squash, Salad with Radicchio, Pear and Honey-Pancetta Vinaigrette, Blood Orange Flan). We took them a pan of these enchiladas as a thank you. Saute onion and garlic over medium-high heat in a small pan until softened and translucent. Set aside. Heat a large pan or griddle over medium heat. Tear the chiles into flat pieces and place into the pan. The chiles will slightly blister and change color. Remove chiles and place in a bowl. 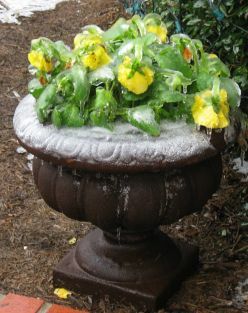 Cover with water and weigh down so chiles remain submerged for at least 1 hour. 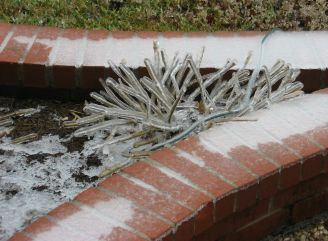 Drain chiles (reserve liquid for another use, if desired – see chili recipe). 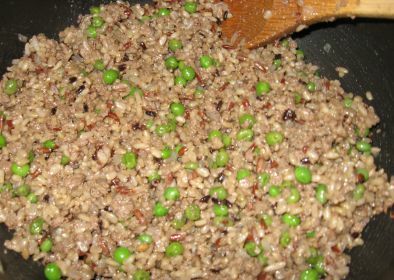 Squeeze lightly and place, with remaining ingredients (including onions and garlic), in a blender. Blend until smooth. Season with salt, pepper and sugar to taste. Place the sauce in a wide, shallow bowl and set aside. Simmer potatoes and carrots, covered, in a medium saucepan until fork-tender. 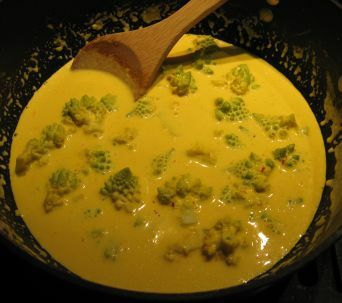 Drain vegetables, then set aside in a medium to large-sized mixing bowl. Saute onions in the oil until softened and translucent. Pour onions into mixing bowl with carrots and potatoes. Tear chicken meat off bones and shred into small pieces. Add chicken to other ingredients in the bowl. 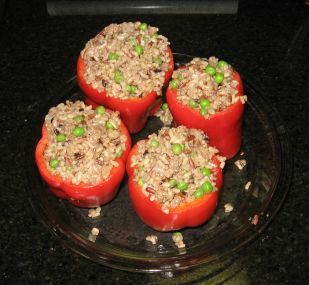 Add a few tablespoons of the chile sauce to the filling ingredients and stir well to evenly mix and combine. Preheat oven to 350 degrees. Heat about 1 Tbsp oil in a small skillet. Add one tortilla to the skillet and cook in the oil until softened – being careful not to cook to long or the tortilla will “crisp” up into a tostada. When the tortilla is softened, remove from the skillet with tongs (careful – it will be hot) and dip it into the chile sauce. Place 1/4 cup or less of the filling into the tortilla and roll up, gently but tightly. Place seam-side down in a lightly greased (we use Pam) baking dish. Repeat with remaining tortillas. We use two 13-by-9 inch pans and can make about 16 enchiladas, but it will depend upon how much filling you use in each enchilada. Spoon leftover sauce over enchiladas in pan and top with grated cheese. 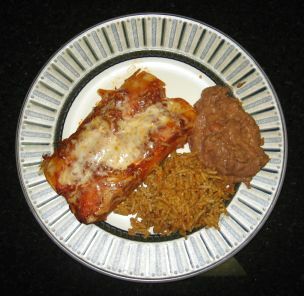 Bake until enchiladas are warmed through and cheese is thoroughly melted – about 10 minutes. Optional:1 15-ounce can pinto or kidney beans, if you must, but beans are anathema to truly authentic “Texas” chili. Even so, I occasionally add them, anyway – you have to get SOME kind of veggie into the kids, after all. Place the onions, garlic and beef in a large, heavy stockpot or Dutch oven-type pan. 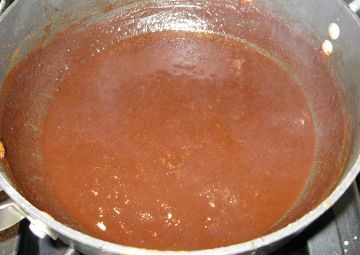 Over medium-high heat, brown the meat (with the alliums), stirring to break up large chunks, until all traces of pink/red are gone. Drain fat off. Lower heat. Add remaining ingredients except water and masa to pan. Stir well to blend. Simmer, uncovered, about 45 minutes, stirring occasionally so that bottom doesn’t scorch. Adjust seasonings to your taste: you can add a little Tabasco or more cayenne if you REALLY want to spice it up. This is a pretty basic, mild recipe to start with – appropriate for grandmas and toddlers in Texas. Of course, I did make a batch for a chili cook-off in Virginia once and it won first place in the “Burn Your Tongue Off” category. Wimps. In a small bowl (or tomato can), blend together the water and masa. Add to chili and stir well. Add beans, if you choose. Stir well. Simmer another 20 – 30 minutes, stirring occasionally. For a gourmet presentation, top with a dollop of sour cream and a sprig of cilantro. 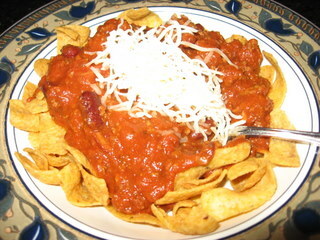 Place a handful of Frito chips in the bottom of a small bowl. Cover with hot chili. Top with finely chopped white onion and grated cheddar. Dig in. 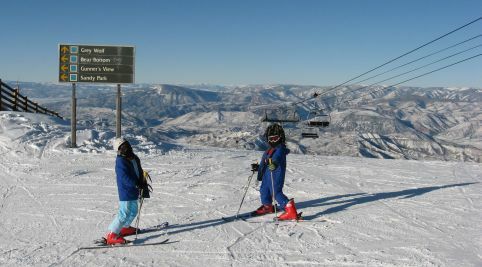 A photo of Girl (on the left) and Boy (on the right, in the cool dreadlock-ed helmet cover), on our annual ski trip. We had a great trip. 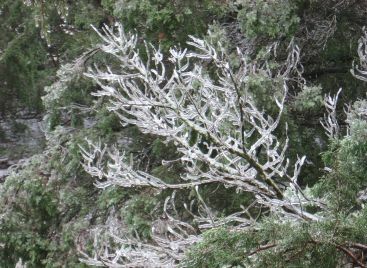 This was at the top of “Elk Camp” lift, right before going down the “Sandy Park” run – one of our favorites. 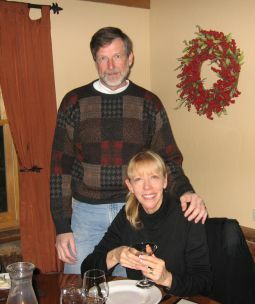 We ate at a wonderful restaurant called Artisan one night (http://www.stonebridgeinn.com/images/StonebridgeInn_ArtisanMenu.pdf). WOW WOW WOW! This place is SO good! We ate here last year, as well. My dad loved the Duck with Drunken Cherries so much that we went back two nights in a row and he ordered it again! Boy and Girl even enjoyed their meals, although they were pretty tired out after a day on the mountain and fell asleep by the beautiful fireplace. I had the Crispy Calamari over Mizuna Greens for an appetizer and it was delicious, then had the Scallops for an entree. 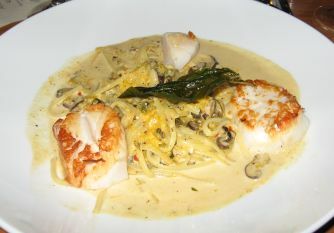 They were served over pasta in a creamy sauce that had JUST enough spice. 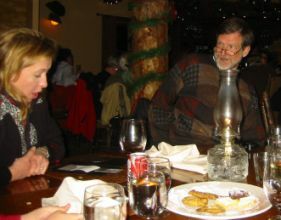 We also had dinner at Lynn Britt Cabin (http://www.aspensnowmass.com/onmountain/dining/default.cfm?id=1386). 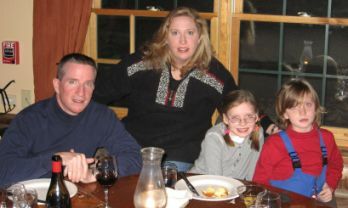 It was lots of fun (we rode a snowcat up the mountain to the cabin) and the food was good (Chicken Breast with Chorizo Cornbread Stuffing and Poblano Gravy….Mmmmmmm…..), but ouch – it was pricey! Me and my dad looking, in shock, at the bill (over $800 for 6 people, 2 of them children).